The traditional model of a computer is a processing unit, which gets told what to do by a program of instructions; the program might be accessed with its own special memory, or it might be sitting in the same area as normal memory, depending on the computer. Each instruction takes a short amount of time to run, and they're all run one by one. From the CPU's perspective, a loop starts up as soon as the computer is turned on, to fetch an instruction from memory, work out what it says, and execute it. In order to keep track of where the CPU is within the program, a number is held by the CPU called the Program Counter (PC). After an instruction is fetched from memory, the PC is advanced by however many bytes make up the instruction. An instruction can be anywhere between one and three bytes. In addition to the PC, other numbers are held inside the CPU that can be used for calculation, and they're referred to as registers: A, B, C, D, E, H, and L. Each of them is one byte, so each one can hold a value from 0 to 255. 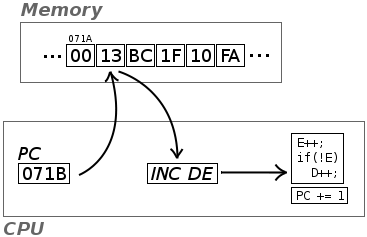 Most of the instructions in the Z80 are used to handle values in these registers: loading a value from memory into a register, adding or subtracting values, and so forth. A known interface to talk to the simulated memory. Carry (0x10): Set if the last operation produced a result over 255 (for additions) or under 0 (for subtractions). Since the basic calculation registers are 8-bits, the carry flag allows for the software to work out what happened to a value if the result of a calculation overflowed the register. With these flag handling issues in mind, a few examples of instruction simulations are shown below. These examples are simplified, and don't calculate the half-carry flag. A processor that can manipulate registers within itself is all well and good, but it must be able to put results into memory to be useful. In the same way, the above CPU emulation requires an interface to emulated memory; this can be provided by a memory management unit (MMU). Since the Gameboy itself doesn't contain a complicated MMU, the emulated unit can be quite simple. With the instructions in place, the remaining pieces of the puzzle for the CPU are to reset the CPU when it starts up, and to feed instructions to the emulation routines. Having a reset routine allows for the CPU to be stopped and "rewound" to the start of execution; an example is shown below. In order for the emulation to run, it has to emulate the fetch-decode-execute sequence detailed earlier. "Execute" is taken care of by the instruction emulation functions, but fetch and decode require a specialist piece of code, known as a "dispatch loop". This loop takes each instruction, decodes where it must be sent for execution, and dispatches it to the function in question. Implementing a Z80 emulation core is useless without an emulator to run it. In the next part of this series, the work of emulating the Gameboy begins: I'll be looking at the Gameboy's memory map, and how a game image can be loaded into the emulator over the Web. The complete Z80 core is available at: http://imrannazar.com/content/files/jsgb.z80.js; please feel free to let me know if you encounter any bugs in the implementation. Imran Nazar <tf@imrannazar.com>, Jul 2010.